As Pudding moves on to another phase of his life it has meant a number of sad endings. In the last few weeks we have waved goodbye to portage, to the gym sessions that he goes to, and to his preschool playgroup. They have all been such positive inputs in his life and I will admit to a few tears on each final session. But there are of course new challenges to embrace. There have been many times when I have wondered whether we’re doing the right thing to choose mainstream schooling for Pudding. Will they cope with his chaotic presence? Will he make friends? Will he be more aggressive in a smaller space with more children? Transition sessions over the last three weeks have been reassuring though. He has had three mornings or afternoons spending time in the FS (Foundation Stage) unit, playing with all the resources and getting used to the environment. Parents were invited to stay for part of each session as well as having some separate workshops. (I did not attend all of those, as finding out what phonics they will learn, or what behaviour and attendance levels are expected is just one more reminder of his differences.) I saw Pudding flitting between all the various resources, but returning again and again to his favourites (balls and building particularly). And I saw how comfortable he is already with his TA (a teaching assistant who will be supporting him full-time); the second time ever that he met her he ran for a cuddle straight away. His class teacher is the same one who has been teaching Twiglet over the last year, so Pudding already knows her and gets very excited when he sees her. Yes, admittedly I did see some of the other children glancing at my sweet boy with distrustful looks; sometimes justified, like when he was running off with the football in the middle of a game. But I know they will get used to him soon enough; his smile and infectious enjoyment of life has won many hearts already. The school has been so helpful and reassuring through this whole process: arranging Makaton training for some of the staff; sorting out a time that our specialist nurse can come and talk at a staff meeting; inviting me into the unit at a quiet time so we could walk around and talk about potential problem areas. One downside of transition though is yet another report on his abilities sent up from playgroup. The Early Years Foundation Stage has 17 areas of learning that children are assessed on – things such as Understanding, Health and Self-care, and Managing Feelings, as well as the reading and writing. As Pudding is now 53 months old he should be well into the 40-60 month level in most, if not all, of the areas. Of course he isn’t there in any of them. In eight areas he is only at the 22-36 month level and speech of course is still in the 16-26 month stage. I knew that but it’s still hard to read every time. I’ve always been one for facts and figures; I want to know things, see how he compares to his peers. Sometimes it has been suggested that it may be easier to avoid this heartbreaking information. But the great thing I can take away from this report is the difference since he started playgroup at age 3. He has improved in every area apart from two of them. Not as fast as his peers of course, but it is still progress. Progress is good. 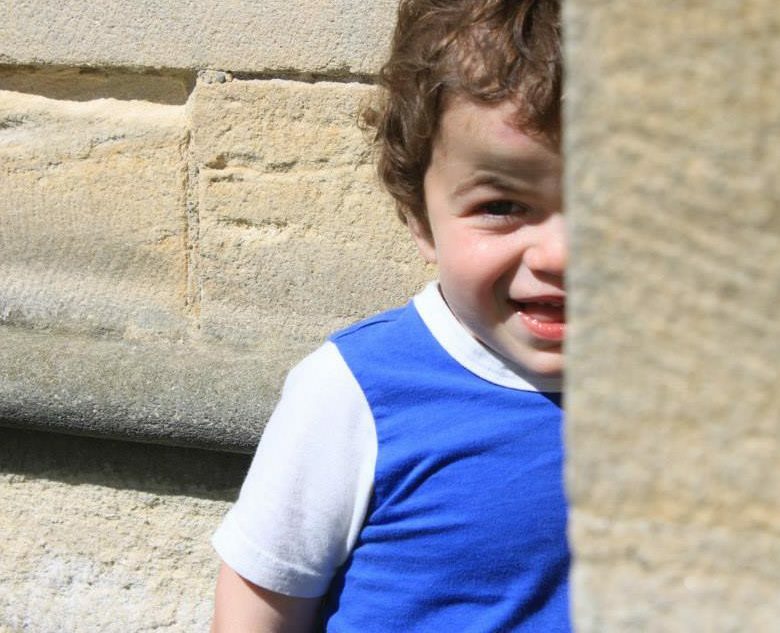 Progress is something to cling to when your son has a diagnosis such as Hunter syndrome; when you dread the day that it may disappear and be replaced by the far colder word ‘regression’. Every time I see progress I am thankful. After diagnosis, it is so easy to drown in the ‘what if’s. What if his diagnosis had been made earlier? What if I’d pushed more to have my worries about him recognised? What if he’d had treatment from birth? What if he was ‘normal’? But ‘what if’s don’t really help, do they? For now, I’m trying more and more to take a leaf out of Pudding’s book. Let’s live in the moment, dance in the sunshine, splash in the pool, pull all the books off the shelf, play hide and seek with our feet, and celebrate each little step of progress! So, I haven’t written much lately. The reason? I’ve spent much of the last three weeks feeling angry and disappointed and downright scared about the future. Bear with me – I’m not wanting to be contentious here. I believed very strongly that we would be better off staying in the EU. I recognise that many people also had valid reasons for believing the opposite, and I don’t think this is the place to argue about those reasons. However, by avoiding writing about it, I’ve tied myself up in knots thinking about it instead. This blog has been where I’ve vented and sorted through my thoughts for the last year, and although this vote seems unrelated to our journey through the trials of MPS, for me it’s not. The truth is, we’re reasonably well-off and Hubby is in a good job which is unlikely to be affected by all this turmoil. If it wasn’t for Pudding, I probably would be able to set aside my worries and just move on. We’ve been told that there is bound to be some economic uncertainty for a while but that we’ll be better off in the long run. But I think the vote couldn’t have come at a worse time just as we are (very slowly) recovering from the global economic downturn. If the last six years are anything to go by it is those on the margins of society that will suffer the most. And that includes the disabled population of this country. Earlier this year the government had to back down on cuts to disability benefits, and this was hailed as a success. Yet the news from those who are continuing to fight for these payments is still worrying. I fear what further cuts are coming, whether directly or by the back door. And I fear that we have a government in place that cares little for the human rights of those affected. Mainly though, I worry about the NHS. It’s clear that there won’t be a massive injection of cash in the years to come. Will there be less funding? And more pressure on staffing levels? And where does that leave us? Pudding already receives one of the most expensive drugs in the world every week as his enzyme replacement therapy. The trial drug that he is currently on is likely to have just as jaw-dropping a price. Even if it is proved to be a success, a health service strapped for cash could easily decide not to fund it. I understand that difficult decisions will always have to be made, but this is my precious son. 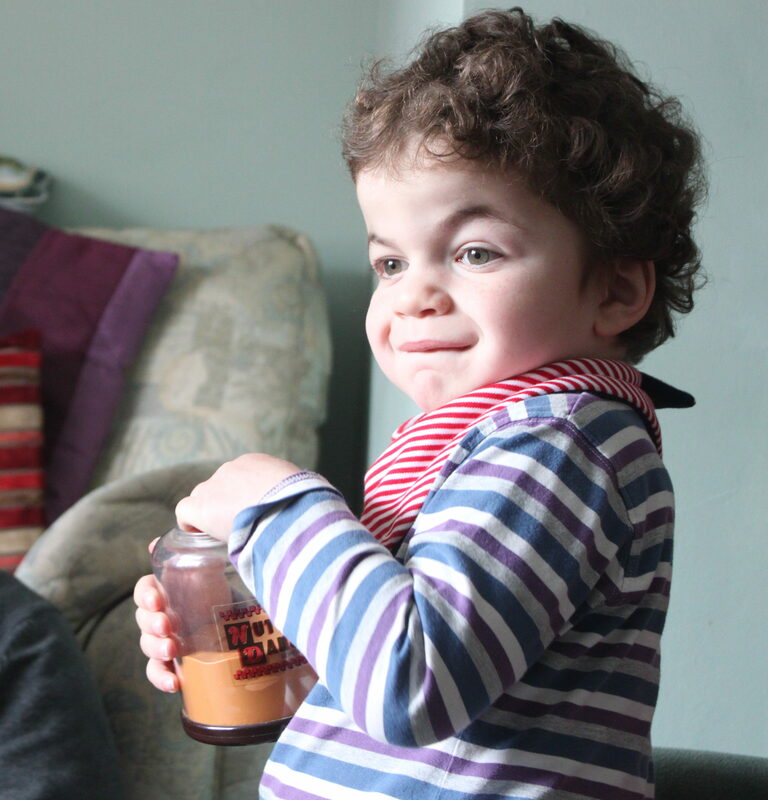 When we first heard the news that Pudding had the severe form of Hunter syndrome we were devastated that he would not live beyond his teenage years. For a while we couldn’t even imagine the possibility that he might still have a future. The clinical trial has given us hope again, and I don’t want that hope to be taken away. This is a situation where I would truly love to be proved wrong. All things that have been said about Pudding lately, and they have made me very happy. Why? Because they were said by two ladies who are long-term childminders and respite carers. I’ve sometimes wondered, in my more hopeless moments, whether I struggle with Pudding simply because I’m not very good at this parenting lark. Whether I’m getting this help under false pretences. Those who’ve had a lot to do with him, such as Sister (who has now fitted locks to keep him out of Niece and Nephew’s rooms) and my mum, would I assume say no, definitely not. Most others only see him outside the home – strapped into his buggy or playing happily in the park – and therefore don’t get the full glory of his behaviour. So when someone experienced at looking after children (both typical and special needs) says things like the above statement, it makes the whole world seem lighter. It says to me, you’re right to want this. You’re not inventing difficulties. The standard Short Breaks offer for families who are able to access it is for 100 hours throughout the year. This can be taken flexibly in a way that suits the individual situation – a regular two hours a week for example or fewer longer days. As is the case with many other families I found the summer holidays particularly challenging last year – 8 weeks break from playgroup seemed to stretch into infinity. So we’re using our short break hours to have a morning every three weeks, and then the rest as longer days in the holidays. So far it has been working well. Last weekend I had Pudding to myself while Hubby and Twiglet went to visit the in-laws, so a morning break enabled me to get through the rest of the weekend in tact. And the time before that, the three of us went trampolining and then shopping for Lego. Spending family time doing normal stuff without the need to meet Pudding’s constant demands is fantastic. Hard to describe, but it’s like I am released to enjoy myself more freely. I know all parents probably need a break from their kids at times, but the sort of usual options – encouraging them to play in their own room, or arranging a reciprocal play-date – just can’t work for us. Don’t get me wrong, I adore my boy, and we have great times together as well, but there’s an element of freedom during respite hours that we just don’t get otherwise. In our longer summer days I’m planning some trips with Twiglet to places that would be a nightmare with Pudding in tow – climbing some rocks may be on the cards! It’s a hard thing to admit that you need a break from your child, but harder still to soldier on regardless. The evening of my last post, Pudding went down with a sickness bug. Little sleep, much washing of towels, endless hours of TV and four days without hearing the word ‘Ungry!’ from him, and at last I thought he was feeling better. Then it was time to head to Manchester for the next trial dose. Even though it is now exactly a year since the diagnosis of MPS II (Hunter Syndrome) was confirmed, there are still days when I find it hard to take in. 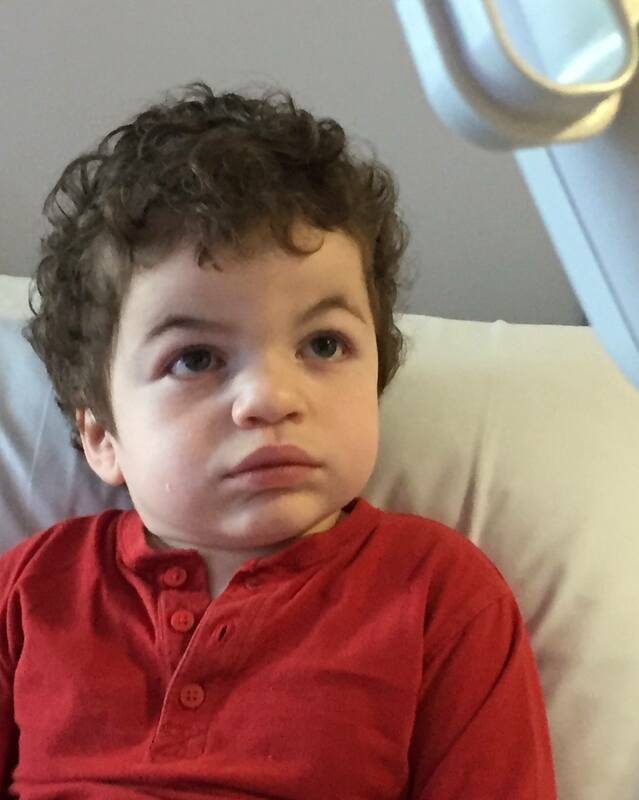 Sometimes it just seems so unlikely that our son can have such a condition. We’re just a normal family with two gorgeous boys, aren’t we? Then there are the times like these last few days when I have no choice but to admit the existence of MPS. We had three overnight stays this visit – two of them in hospital. He spent the rest of the afternoon slumped on the bed looking pale and limp. Of course, when things have been bad they usually get better again. The next day we had an audiology appointment that shows his hearing is still doing ok with the grommets in, and he is almost at the developmental stage where he can do the proper test. (Waiting to hear the beep BEFORE he jumps the little men into the boat is still a bit beyond him). We also escaped to the nearby museum that afternoon for a hot chocolate and cream scone (his appetite was coming back) and although I got more soaked than a drowned rat on the way back, hospitals are a great place for drying things out (including my eczema-prone hands, but I’m trying to be positive here)! And best of all, when Pudding decided to get out of bed at 1.30am and run around the ward corridors waving a light sabre, I was able to go back to bed after two hours and leave the night nurse in charge of him. Apparently he only tried to escape from the ward a few times, didn’t destroy anything and was asleep by 4.30…. And then – home again, and the blessings of our own beds and familiar things around us. The school run and cuddles with Twiglet. Letting off steam in the playground. Ben and Jerrys icecream. MPS governs our lives now in so many little ways. It isn’t just a bad dream that I can wipe away with the sleep from my eyes. It’s our reality. When I started this blog I gave it the subtitle ‘Learning to live with MPS II’ and that’s just what we’ll continue to do. Most of the time, we’re doing it pretty well.